SMOOTH AND STRONG PERFORMANCE: A compact, single-overhead-cam design and long piston stroke give Mercury 40 - 60 hp FourStroke outboards more low-end torque for excellent acceleration, even when pushing a heavy load. 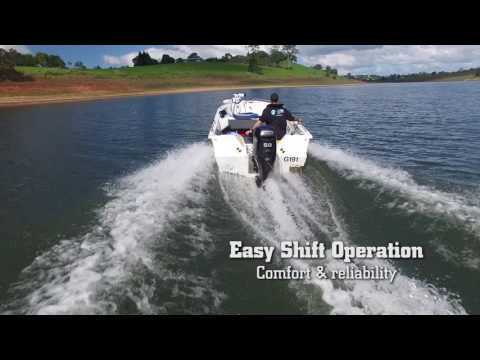 The high-displacement, long-stroke, four-cylinder, single-overhead cam design provides optimum power and a smooth ride with Command Thrust models. THUMBSCREW CLAMP BRACKET: The 40hp manual start, long shaft (20" / 508mm), tiller steer model is also available with a thumbscrew mounting bracket. This bracket reduces the time and effort needed to install or remove the outboard from a boat's transom. VESSELVIEW MOBILE: Now you can have the power of SmartCraft on your mobile device (iOS or Android) with all the digital data your SmartCraft engine supports - plus new features such as Maintenance Reminders, Mapping, Performance Summary and Fault Code Diagnostic information. Connect with your engine and be in the know. 1) Connects the SmartCraft data network to your iOS or Android mobile device via BLE (Bluetooth Low Energy 4.0)* 2) See SmartCraft engine parameters: fuel flow, water temperature, battery voltage, RPM, engine hours* 3) Get fault code diagnostic information so you know and understand if that fault is something to be addressed when you return back to the dock or it is something more significant* 4) Get mapping information for your body of water: location, record a moment on the water, fuel & restaurant locations and more. 5) Dealer Locator and Primary Dealer selector. 6) Checklists associated with your boating lifestyle. 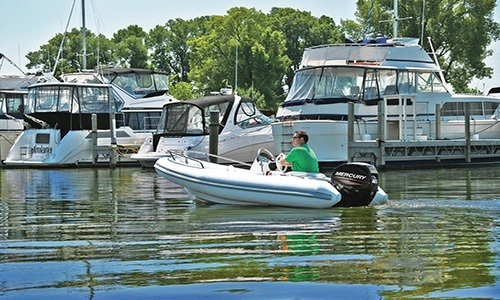 7) Maintenance reminders and historical maintenance information logs* 8) Compatible with all Mercury SmartCraft-capable engines built since 2003 (40 HP and up). 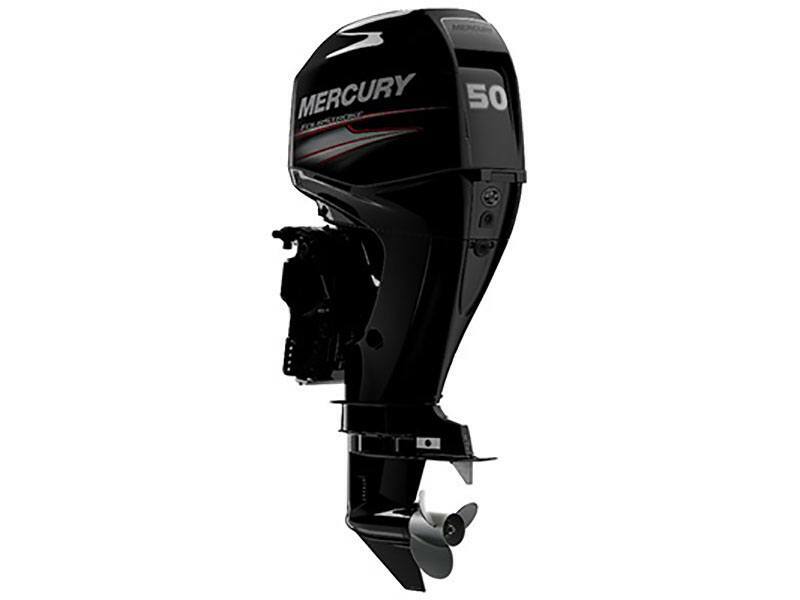 *VesselView Module required; available for purchase at Mercury Marine dealers, from the VesselView Mobile app or here. Android® is a registered trademark of Google®, Inc., Bluetooth® is a registered trademark of Bluetooth SIG, Inc., iOS® is a registered trademark of Cisco Systems®, Inc. (used under license by Apple®, Inc.), SmartCraft® and VesselView® are registered trademarks of Brunswick® Corporation. TURNKEY STARTS / FUEL EFFICIENT: Mercury Electronic Fuel Injection (EFI) delivers reliable turnkey starts, improved fuel efficiency, instant throttle response and protection against low-quality-fuel problems. 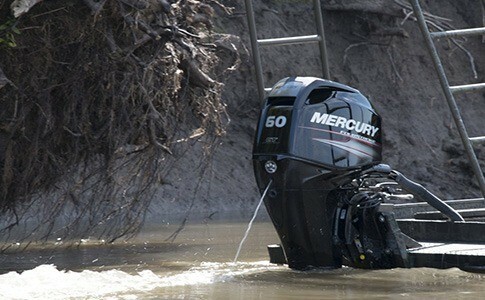 SPITFIRE AND SPITFIRE PONTOON PROPELLERS: The advanced design of the Mercury® Spitfire® aluminum propeller combines four aggressive blades with high rake angles and extra cup for tenacious holding and 25% quicker acceleration, with no loss in top speed compared to a three-blade Mercury Black Max® propeller of the same pitch. 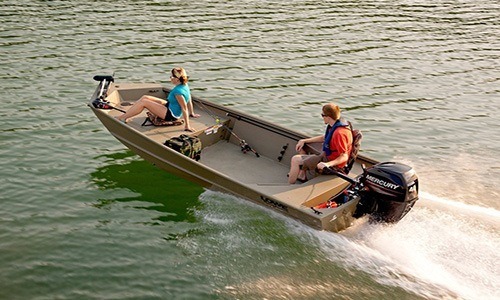 The advanced design of the Mercury Spitfire Pontoon four-blade aluminum propeller maximizes blow-out resistance, with extra blade area for outstanding hold in turns and extra thrust around the dock that pontoon boaters need and demand. 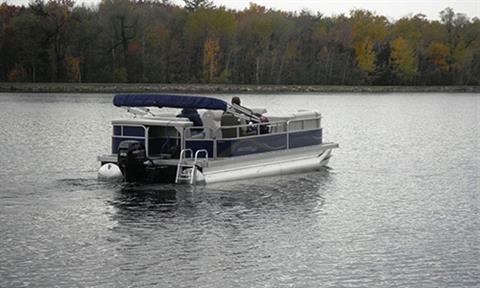 The Spitfire Pontoon propeller is available for 40 - 60 hp Command Thrust engines in 10-, 11- and 13-pitch sizes.